Today it is the turn of Noelia to share her tutorial. 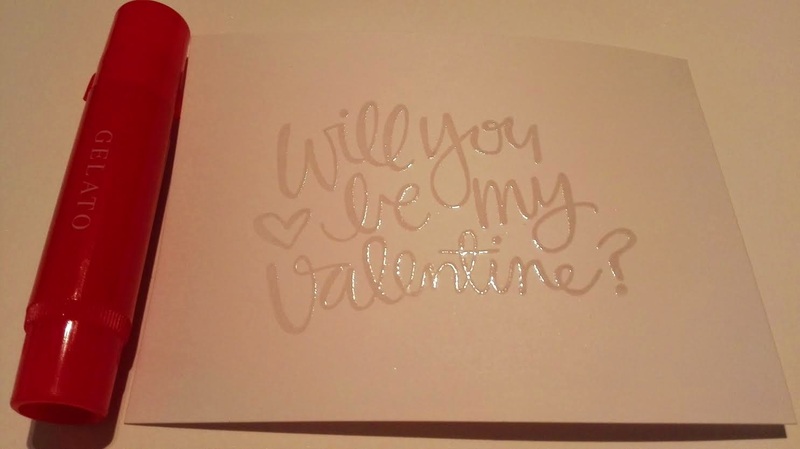 With Valentine's day being next weekend this is a beautiful card to inspire you! I will hand over the Noelia to explain the process. 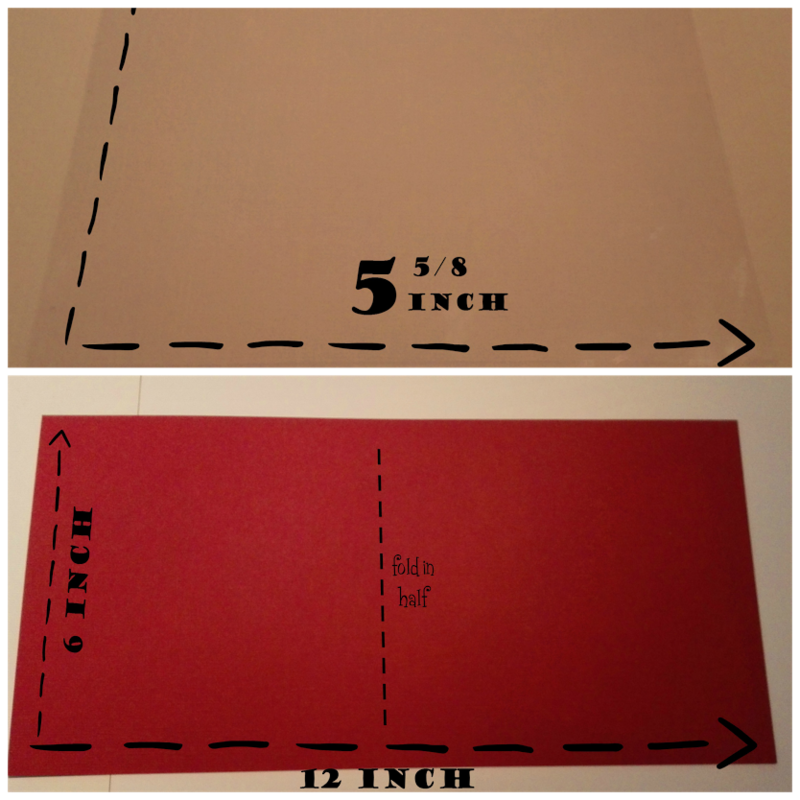 Cut a piece of card stock to measure 6 x 12 inch and fold in half. In the left half, draw a window 4 5/8 inch and cut it out. 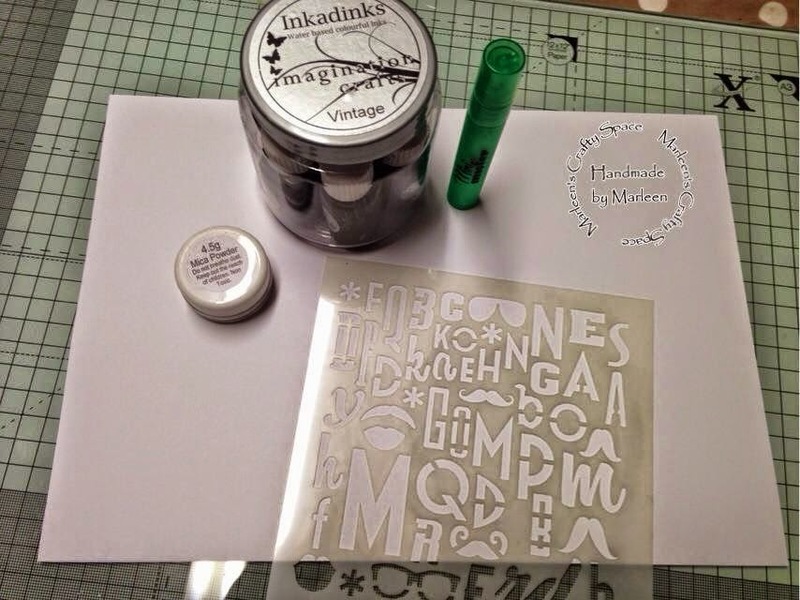 Take a sheet of acetate and brown card stock and cut them to measure 5 5/8 inch. 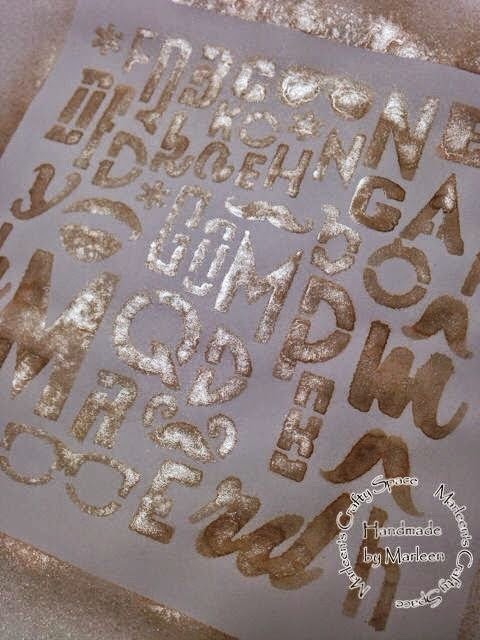 Place the "Wall Stencil IC" over the acetate sheet and tape down and spread Antique Bronze Sparkle Medium over the stencil. When acetate sheet has dried, stick it to the inside of the window and stick the brown card stock to the other half of the card. 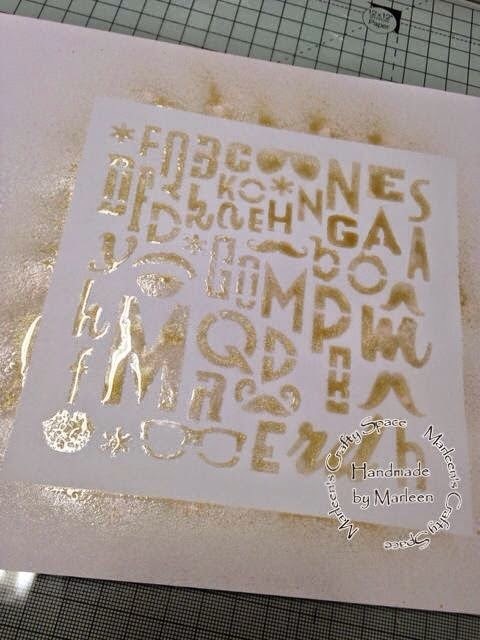 Take a white card stock, stamp the sentiment and emboss it with transparent embossing powder. 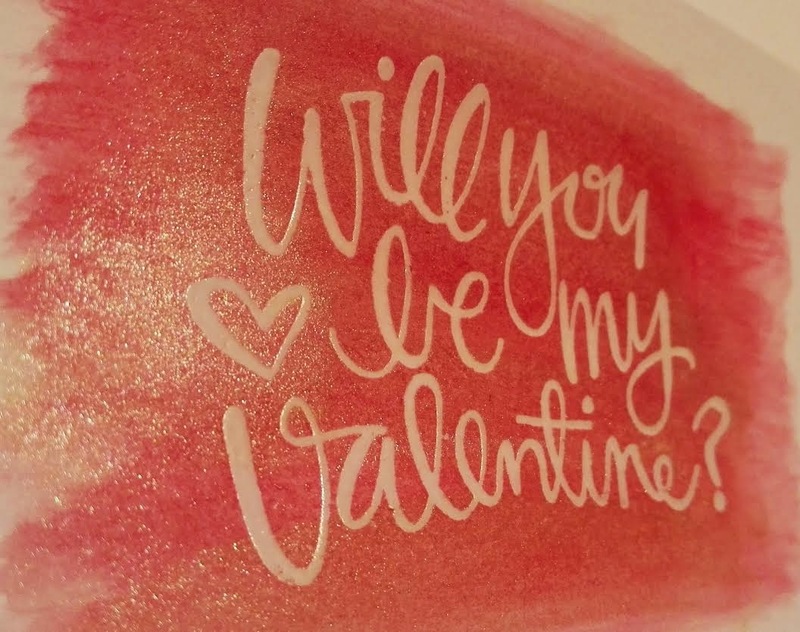 Take your Gelatos (if you don´t have, distress inks or watercolour pencils will serve) and play with them!! Enjoy!! 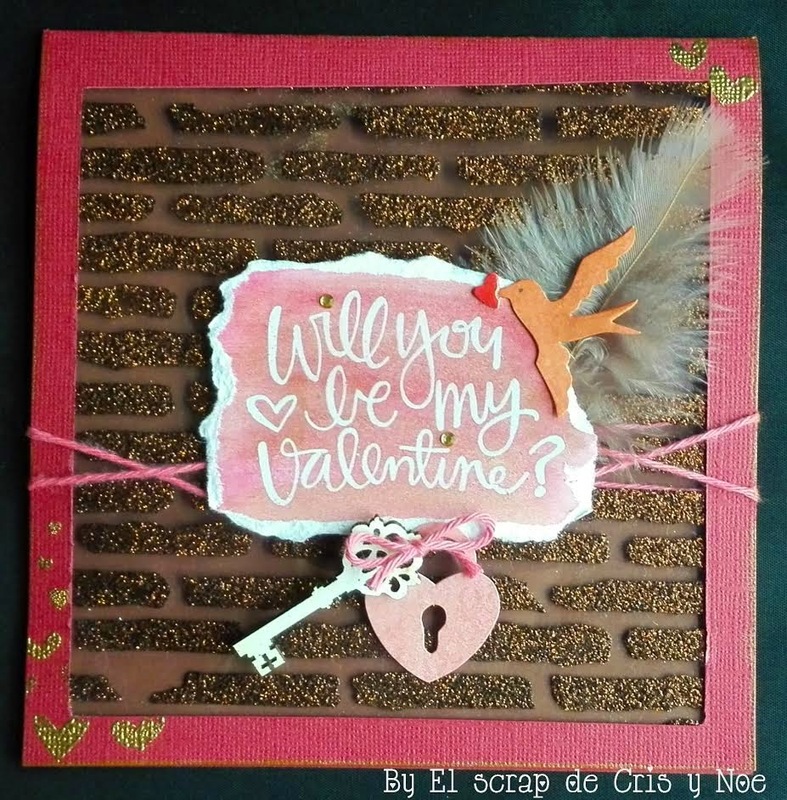 Stick your sentiment panel in the middle of the card and decorate with die cuts, wooden embellishments, gems, feather and anything else you wish to use! We hope you have enjoyed this beautiful tutorial. 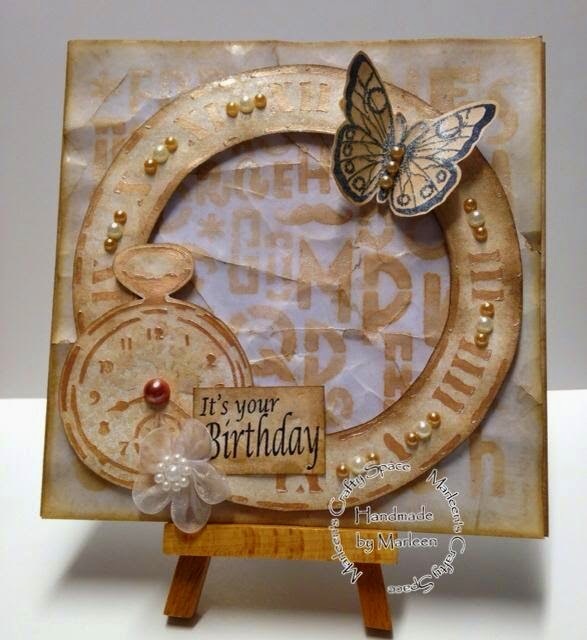 Today it is Marleen's tutorial to share! I am handing over to Marleen to go through her tutorial with you. For my tutorial I have had a play and made my own little spray mist. I filled a mini mister with water and added 3-4 drops of the Coca Inkadink ink to it. 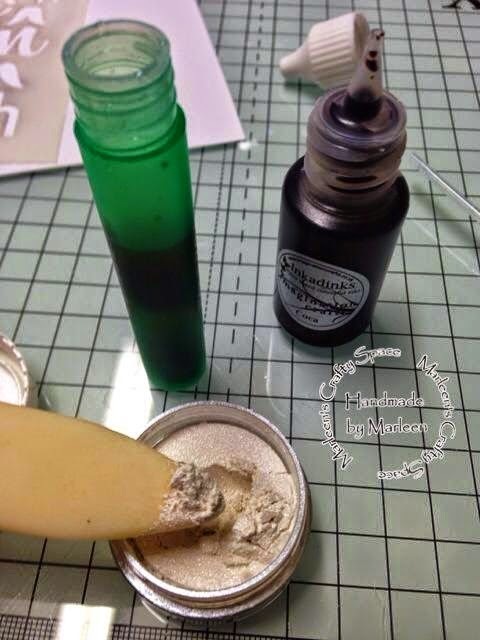 I then added a a pinch of mica powder and gave the bottle a good shake. I lay the "alpha mask" on top of a piece of white card stock and started spraying. I covered the whole mask. I removed the mask and left my card stock to dry. I think it shows really well how shiny the spray came out. 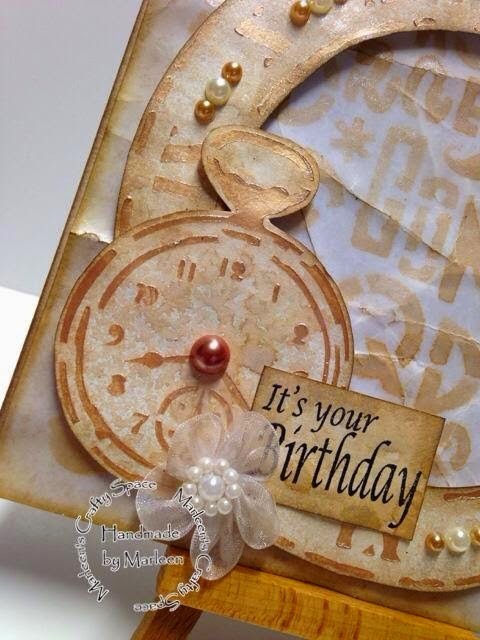 This is the completed card using the above background created. I made the clocks using the "Clock & Fob" mask with the Silkies paint. Once the paint was dry I used the rest of my already made spray from above and covered both clocks before cutting them out. 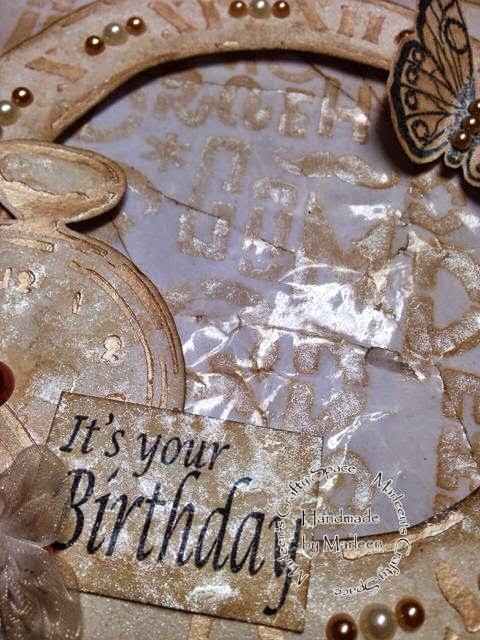 Before I put my card together I took my background and covered it with Versamark and clear embossing powder. 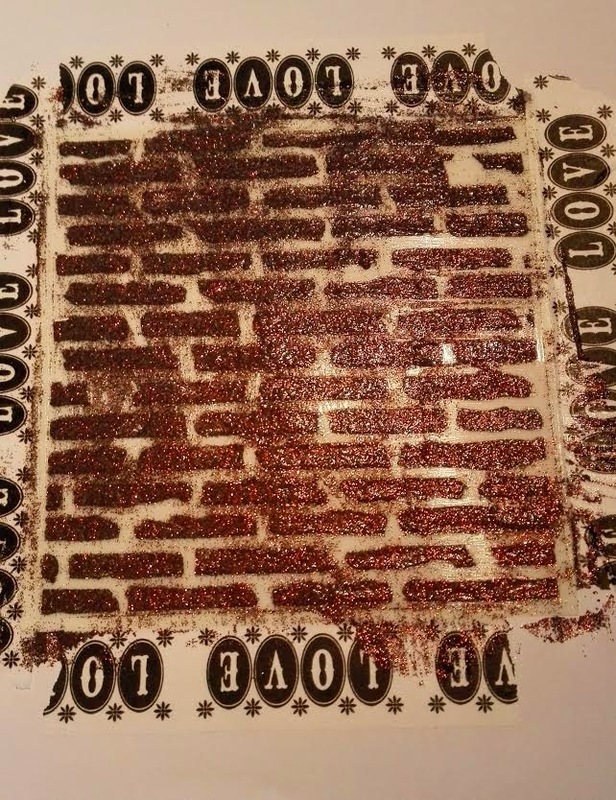 I did 2 coats and left it to harden. 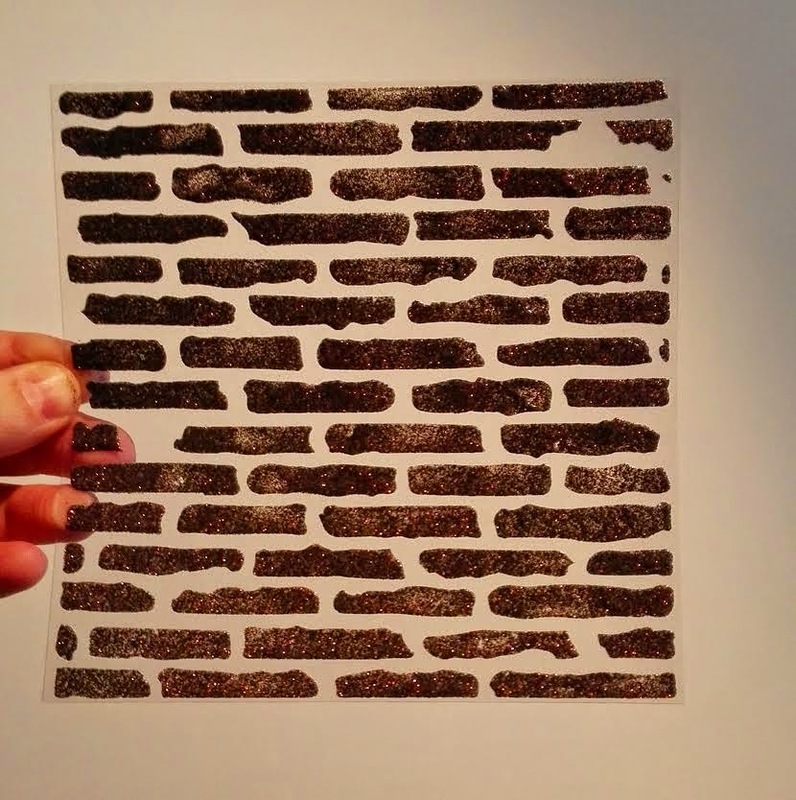 Once hardened I took the paper and crumbled it up to create some cracks which I dabbed with distress ink. 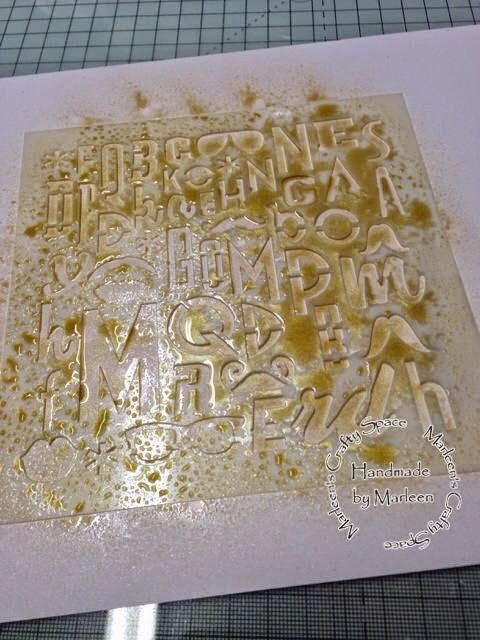 The greeting is from the "Dragonfly" Decoupage stamp set. 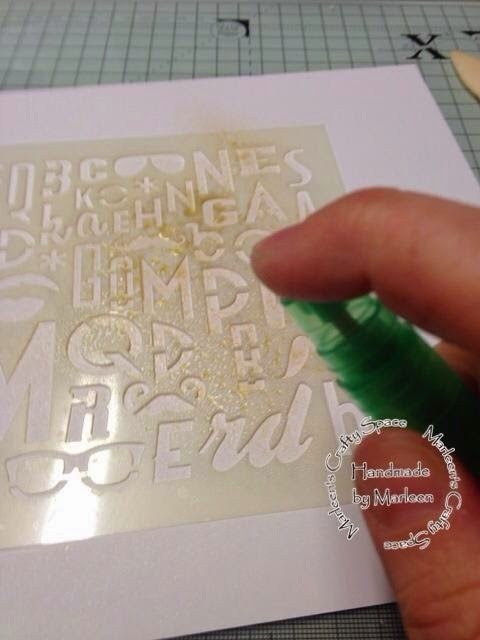 It is stamped with black ink and sprayed with my spray and cut to size. 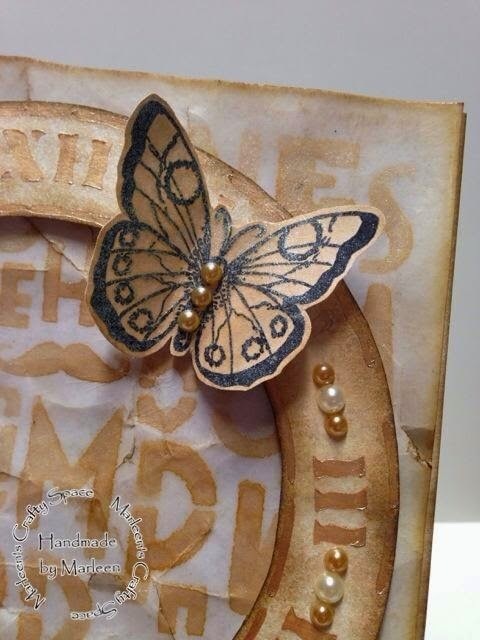 My butterfly is from the "Butterfly" gilding stamp set, also stamped and sprayed before cut out. To finish off I added pearls and the little flower. So what do you think? Something a bit different. Thank you for popping by and for any comments left behind.